I was born in Long Island and raised in Brooklyn, NY. As a young black male this was not the best of places to grow up, but I made do. I spent most of my young years in the Red Hook projects section of Brooklyn where I was privy to many things that too often young people in the projects are exposed to. In those types of places you have to choose where you are going to fit in. 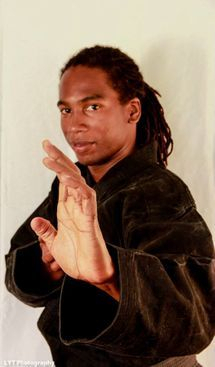 It's either eat or be eaten, “survival of the fittest,” and because of my martial arts background, I quickly found myself as a muscle man. I learned the streets and how to survive in them, and even though many times I came very close to it, I avoided going too far off the edge. I fought a lot in Elementary School, Junior High School, and in the streets. I became really good at it, rarely coming home bruised, so I didn't get in too much trouble. I quickly began to enjoy my status. As a young child running so free, I never knew what I was getting myself into. I was lucky to participate in the neighborhood programs that offered outlets, and because of that I was able to keep in line. The Polica Athletic League (PAL), Camp Friendship, and The Jackie Robinson Center for Physical Education were all very crucial in keeping me from truly becoming a product of the streets. At the age of 12, I was given the responsibility to teach children younger than me in my father’s program “Leadership 2000,” based in Brooklyn and the surrounding areas. I didn't know then that this experience, which I didn't appreciate and only endured because my father made me, would be a game changer. The negative energy that I faced with when I first arrived in the projects confronted me again when I got to high school. As a freshman coming from out of town, I appeared to be a quiet kid. The older students wanted to test me to see what I was made of. I, being a veteran in the street game at this point, quickly re-established myself as “the dude you just don't mess with.” I quickly made friends after that. We called ourselves SCARZ, and were the dominant force at the school. Though there was no one to rival our numbers and strength, the equation didn't add up to students on the path to graduation. One day I was walking with my father through downtown Brooklyn and I heard someone calling my name. They were yelling so loudly that I thought it might have been someone that I had done something to, but I was wrong. The shouts were coming from a young man about 14 years old who had been my student when he was 9 and I was 12. He started to tell me how his life was so different because of the decisions he made after taking the classes when he was younger. Now, he was proudly in school, had good grades, and worked as a lifeguard at the local pool. A light went off in my head. "This is it," I thought to myself. This is my why. Back to reality. I was still in high school, and still a SCARZ member. The following year things came to a head. After a huge altercation in the auditorium I was quickly made the scapegoat along with 5 of my friends. Our fate? Expulsion. Game over! I was scared that everything I knew would come crashing to an end. Even for someone with my reputation, hope somehow remained. Once my gym teacher and my basketball coach found out the situation they immediately went to bat for all of us. We were terrors, but we were liked as well, and they also had faith in us. 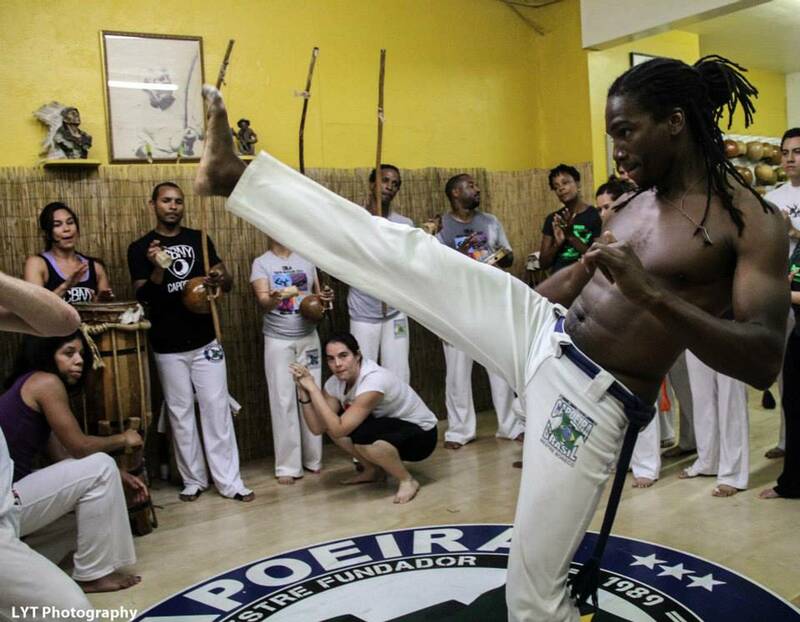 So, we were given an ultimatum: Mestre Jelon Vera and the Brazilian martial art called Capoeira. Either we agreed to learn this art form or we would get expelled from school. It was a no brainer, don't you think? Little did I know that this thing, this dance, no, this fight, this music, this history, this art, this community would become the thing that gave my life more meaning and purpose then it had ever had before. I went on to graduate from high school in the top 15% of my class and went off to college, taking Capoeira with me everywhere. In 1998 Mesrtanda Edna Lima invited me to participate in the Capoeira Jogos Mundias representing the US in Rio de Janeiro. The experience changed my life. "Upon my arrival in Rio de Janeiro, Brazil around 1998-1999, I immediately noticed the significant amount of homeless and abandoned children in the streets. Because of my own troubled and uprooted upbringing, I wanted to understand the reasons behind this unfortunate scenario so I could attempt to make a positive change." I was amazed by Brazil. Its people, its architecture, its food, everything. From the minute I stepped off the plane I felt at home. However, I was almost as immediately slapped in the face by a previously unknown, heartbreaking reality. The number of homeless children was at an astounding number of over 40,000. I simply couldn't believe it. How could a country that gave me something so rich and full of life be experiencing something so tragic? Seeing this completely changed my perspective. It was time to do something. After that first trip, I decided to dedicate my life to helping the world’s children, and I would start in Brazil. I now work with roughly 110 children in Bahia during the Brazilian summer. Soon, I want these children to be in contact with children from other countries. I believe that if children are brought together and are able to experience other cultures at a young age, they will begin looking at things from the perspective of a global family, instead of from a singular, national approach. Thank you for taking the time out of your busy day to find out what I am doing. I truly appreciate your interest and support. To all of you that know me, thank you for believing in me and what I do. It is you and your love that keeps me pushing forward. Please continue to spread the word and support the cause. We are lighting the beacon for world peace.